A great free tool to make a slide show of your photos with music in few clicks. Advanced RM To MP3 Converter is an easy to use and powerful software. Convert all video and DVD movies into iPad-ready formats. The easiest way to rip and convert DVD to MPEG format. Free software utility acquisitions from the best in download catalogues! Browse the featured computer tools lists, watch the latest refreshes of the popular programs apps, and get right away! Do not lose an advantage to get the hottest package: utilise SoftEmpire website to setup package for free of charge. See the catalogue of shareware and software tool demo versions. Search among OS services programs, acquire managers, playgames, and all other kinds of software for your PC or digital phones! 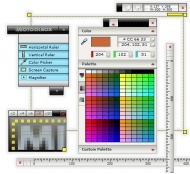 MioToolbox is composed of five handy graphics tools available at any time from a single mouse click: The pixel ruler, color picker, screen capture, lens, mouse lens, and more. Located unobtrusively on your desktop, MioToolbox remains accessible while you work. You can use any of MioToolbox's tools back and forth from any application without the need to close and open the whole application each time. MioToolbox's toolbar can be moved anywhere on the screen in compact or extended mode for maximum flexibility. Each of the tools can be launched with a single mouse click at any time. You can start any MioToolbox tool at any time while working in another application. The selected tool will pop up over your current application and minimize itself when you're done. Arclab FileIO/System Toolbox is a set of easy to use but powerful functions for File, Folder, Shell, Windows API and System operations and for gathering informations. The utility for any serious Windows tweaker! Change hundreds of registry settings from WinXP, improving appearance and performance. Prevent others from changing your settings, increase Windows security. Administer all user accounts on your computer! Enter the color in decimal, hexadecimal, select it from the palette, capture it from the screen, or paste it to or from the clipboard. Find the closest web safe color to the current, display the pallete. Make, save or load your custom palette...Free! Application creates JPEG pictures, logos and banners for your Website. It has object-oriented interface which helps you edit graphics, work with texts, and apply graphic effects like shadows, flames, transparency as well as warp and modification. Logo Maker simplifies your logo design work with 190 templates, 400 color schemes, 2500+ graphics and one-click text/graphic effects. You can also extract a Flash file and reuse its graphic elements. Easily output your logo for web or print.